I hope you’re all having a fabulous week!! I certainly am and it is very much due to the amazing and beautiful sunny weather we are STILL having! It seems that summer has arrived early and it is just the best! I’m pleased to announce that my creative slump is officially over! I noticed that today as I was leaving the house for work, I had an urge ‘make’ which I am sure was directly related to the fact that I couldn’t! So I’m back on the hooking buzz with enthusiasm after a week or so of not doing much! I’ve been contemplating my Granny Circles for a while now, and decided that it is time to re-do that tutorial, as since I first had a play with making the circle back in August, I’ve learned a few new techniques and stitches, and I like the way I’ve been doing the centres lately much more… they’re not as ‘squished,’ so I decided to do up a brand spanking new tutorial! Please remember that the mandalas will be a big bigger when finished as they need to be blocked… I lay gladwrap on my carpet in a sunny spot and wet the mandalas, then pin them to the carpet gently stretching them out to their full size and leave to dry! This tutorial is for a flat piece of work and it is not intended to be used as a cushion, so please work the increases accordingly if you have other purposes for this!! I’ve seen some amazing creations in ravelry with the beautiful granny mandala and some STUNNING colour combining and I’m hoping that after this refreshment I’ll see many more! I love seeing these beautiful circles spinning joy through my computer screen! if you make one, let me know! I’d love to come and see your beautiful work. Soooooooooooooo………. Get your 4mm hook and your 8ply wool ready and let’s get started!!! Round 1: Make a magic ring…. if you’ve never done this before now, click here for step by step photo instructions….. and into this circle make 3ch (counts as 1dc) 1dc, *ch1, 2dc* repeat ** until you have 6 2dc’s separated by 1ch each, join with a slst to 3rd chain of original 3ch. Pull the end of the magic circle closed nice and tight and weave in those ends, go on, weave as you go! Round 2: Join next colour with a slst into a 1ch space from previous round and ch3 (counts as 1dc) 1dc, ch1, into the SAME space, dc2tog, *ch1, into the next space dc2tog, ch1, dc2tog* repeat sequence until each 1ch space from the previous round has 2dc2tog each separated by 1ch. Rounds 3 & 4: Join new colour with slst into a 1ch space from previous round, ch3 (counts as 1dc) into the same space, make 2dc, *ch1, 3dc into next space* repeat until end of round and join with a slst into 3rd ch of original 3ch. Each 1ch space should be filled with 3dc each cluster separated with 1ch. Yes! That’s better! Photos are far more interesting than words!!!! OK… let’s make our first round of increases….. Round 5: Join new colour with a slst into a 1ch space from previous round, ch3 (counts as 1dc) 2dc, 1ch, 3dc into same 1ch space, *ch1, into next space 3dc, ch1, 3dc* for entire round, at end of the round ch1 and join with a slst to 3rd chain of original 3ch. Round 8: Increasing again, but this time only in every SECOND 1ch space from previous round. So, join new colour with a slst to 1ch space and ch3 (counts as 1dc) into the same space, 2dc, ch1, 3dc, *ch1, into next space 3dc, ch1, into next space 3dc, ch1, 3dc* repeat for the entire round and at end of the round ch1 and join with a slst to 3rd chain of original 3ch. I love watching rainbows emerge….. they get more and more beautiful with every colour! Rounds 9, 10 & 11: No increases, just repeat rounds 3 & 4. Rounds 13, 14 & 15: No increases, just repeat rounds 3 & 4 again…. Round 16: Increasing every third space, repeat round 12. This is a nice size mandala and will be bigger after a darn good blocking!!!!!! From this point onwards, just keep repeating the increases with three rows between them without increasing, the edge with your favourite edging! I usually do a round of sc, then a mini shell-stitch: With right side facing you, into 1 stitch make 1sc, 1hdc, 1sc, slst into next two stitches and repeat sequence all the way around. I added a few extra rounds to this one in natural undyed wool…. I had grand plans to make it into a veeeeeeeeeeeeery special baby blanket, but then remembered that I hadn’t make the ends secure enough to stand the wear and tear, so lucky for KB, as she LOVES this one (natural fibre addict) it is the new centre piece for our table and it looks awesome. OK, well I hope you have lots of fun making yourselves some beautiful mandalas!!!! If you’re a raveler and want to bookmark/ queue/ hook it! Click HERE for the link to all of the patterns and tutorials I’ve popped on there. And click HERE for google images of beautiful mandalas where you can click to get lots of info for your beautiful selves! I’m off…. must fly…. it’s 6pm already… where did the day go? Boring jobs await my creatively-itchy hands… think big piles of dishes… an unmade bed and dinner awaiting cooking…. Oh and a Raymond to feed too! p.s thinking of perfect blessings… thank you…. oh THANK YOU anonymous person who handed my cay keys in to the supermarket customer service desk this afternoon…. you are a flipping legend and gratitude did not even cover the feeling I had when my keys were back in my hands! 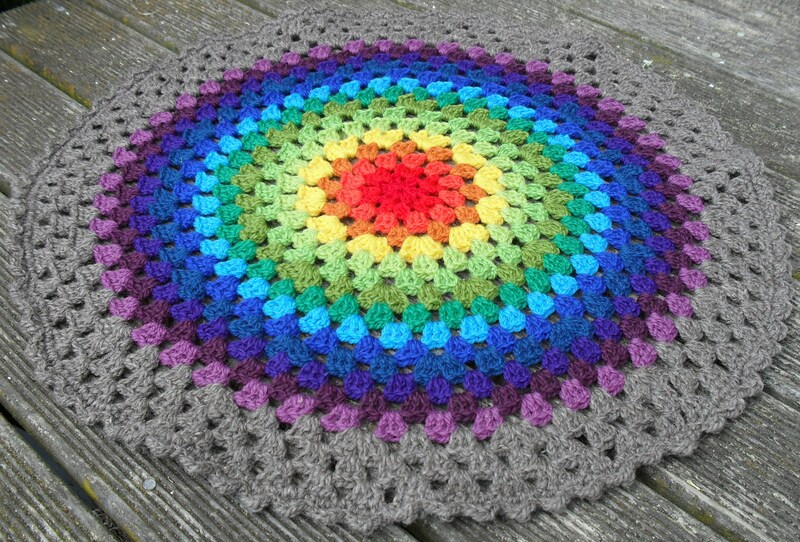 This entry was posted in Colour Therapy!, Fibre P0rn!, Granny Mandala, Rainbows!, Uncategorized. Bookmark the permalink. 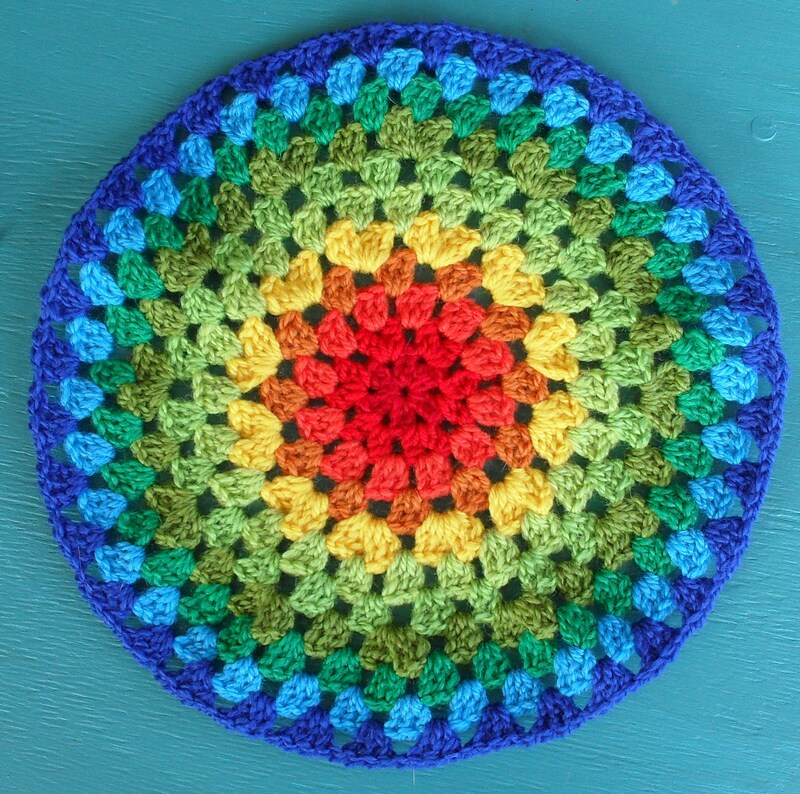 166 Responses to Revisiting the Granny Mandala…. 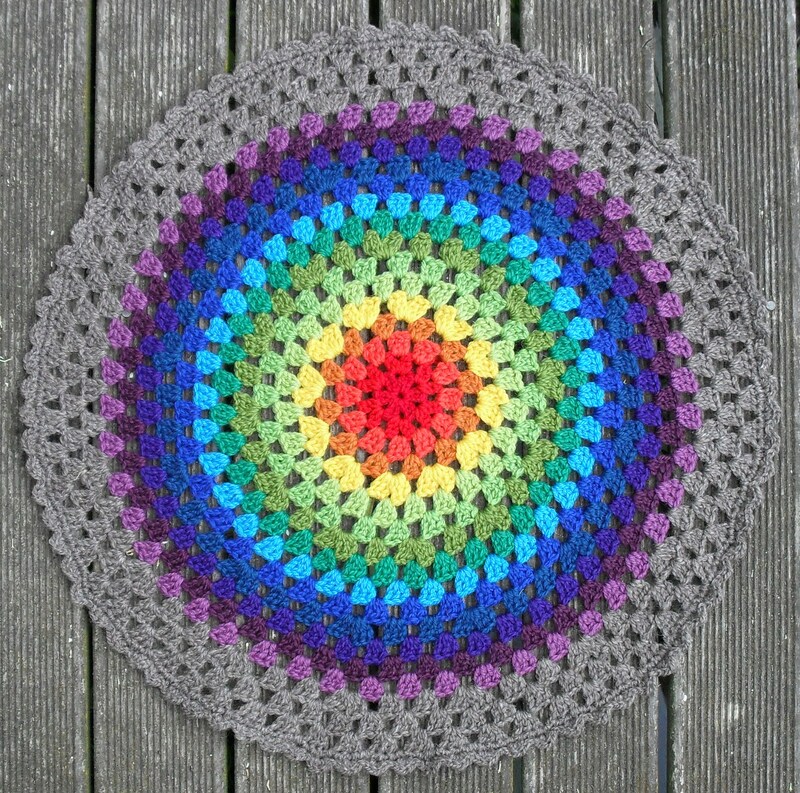 Love the Colours and love much more the Granny Mandala. mmm that purple on grey, stormy, moody blues. ❤ Love. I've definately got a resonance with those colours. You've definately got your mojo back! not that I think you lost it, I loved the Incan/mexican inspired mandala too. I love your rainbow mandala. I’m going to bookmark it for later. I’m knitting holiday gifts to mail back home. Hi Alice, since a real novemberstorm was predicted for today, it will be a perfect day to try this new tutorial you made. I am very much in love with your rainbowcolours. I used to teach at a Waldorf school and the children over there were using rainbows all the time and I just loved it. In their drawings, but also when they were knitting or crocheting. It made their work so vivant and a joy to look at. Your mandala looks beautiful, I love the colors and how it turned out, fabulous! Thanks for sharing, great tutorial! I just wish to give it a try! Hello Alice! Great colourful Mandala and thank you for your tutorial! I love your mandalas – so colourful. I wish I had a wee bit of talent when it comes to colour combinations 😦 Think I might have to sort through the stash though and make one too. Thanks for the tutorial. Big hugs to you and of course Mr Raymond. Mandala-rific indeed!!!! Love those gorgeous colours! What a great idea! Thank you so much. Apparently I’m color coordination deficient. Be Well! I love it, makes me smile. This is a great tutorial for a very pretty colourful mandala. I’m going to try to make one using what I have already in my stash. Thanks for sharing! It’s very pretty, Alice. I plan to make one! Thanks so much for sharing. You know that I love the bright colors you use. I will get around to making one of these. Can’t wait! Beautiful! I’ll try it! Thank you Alice, and thak you to Raymond too! Wow! Just love your colour choices, you have such a good eye for colour combinations. Thanks for Raymond and your advice on my scarf dilemma and pushing back when people asked me to make things for them. I had a quite a giggle over it. Your brain thinks just like mine – cost of yarn and my time! Only my boys get an immediate YES when they ask me to make them something. I love seeing yarn on other people’s blogs, it just cheers me up so much. Looking at the scenes across your bay you have lovely weather to look at too, we have seriously grey, wet and windy so keep sending all the colour you can our way. Anyway, what a wonderful blessing being able to share with you…. I’m another Alicia and I just discover your blog. From now I read you. This is some yarny, circly colourful smiliness. I needed it this evening – I’m holed up with a virus of some kind. Thankyou! I love the colors of your mandala! Thanks so much for the tutorial – I think I’ll try it in some nice christmasy yarn as an accent for my table! Beautiful colors and great tutorial.. i’m now trying your mandala… i love to do this….. thank you so much for this tutorial. Sorry if this has been answered already, but are the patterns in British terms? Thanks! I’ve been enjoying your blog, everything you create is just beautiful! Thanks for the tutorial. I started working on my granny mandala this afternoon. Hi Alice its lovley choice of colors … Im from Qatar ,my mom & I were looking for teapot cover and came across this blog love it…. I just completed two Manada’s from your pattern and love it. I posted the pics on my blog site. I hope you check it out. Thank you for sharing patterns, I am going to try other projects that you have posted. I figured out what I did wrong. I misread and misunderstood a couple of rounds..I guess I was so in a hurry to start one that I wasn’t reading it correctly…I would like to know though, if I want to make a bigger one, what is the formula for increasing? I’m still in the learning process and was wondering how to figure that out. I LOVE LOVE your colors. Just watching it makes me so happy. Hi Alice! I love your mandalas and all the granny-stuff you make – I’m so inspired! 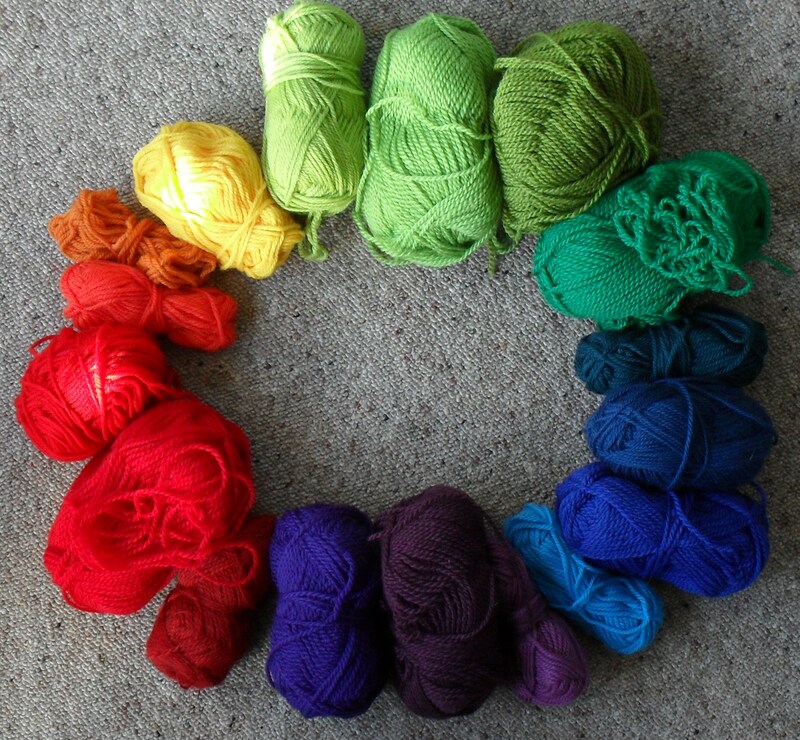 What brand of yarn are you using for your colorful mandalas? I am having a hard time finding yarn the right ply in the colors I want – do you mind sharing your source? Help, please! You have so many lovely tutorials I would love to try. THANK YOU THANK YOU THANK YOU for posting this tutorial! I found it yesterday and made my first one today! Thank you so much for the tutorial. I’m a beginner and your blog is pure gold for me. Wow You do amazing work! I love it all!!! Thanks for sharing. I just finished making this mandala. My little five year old is really into rainbows right now and he is as over the moon about it as I am. Your use of color really makes me think outside my usual box. Love your work and your site. WOW, what a discovery you are! I LOVE your choice of colors … what an inspiration you are! I got so excited, that I think I subscribed to your newsletter twice. I want a cat like yours. Love your mandalas!!! The colors are gorgeous! Do you have a printer-friendly pattern that I can print out and carry with me? I don’t always have a computer available. I am in the middle of making a large mandala. I was wondering if you just continue with the 3 plain rows and then the increase row with increases every third stitch. Marillyn, just how big are you making your mandala? I am also trying to make a large one, but am on round 20 the shells didn’t come out right. Got all the way around & ended up w/the 3dc, ch1, 3dc right next to the first one of the same. ??? Checked all my stitches last four rounds & find no mistakes. Any ideas? The same thing happened to me. I’ve counted and recounted everything and can’t find the error. I notice this was posted quite some time ago, but I’d love to hear from you if you have any advice. I’ve made 2, one was much bigger than the other. I just followed her instructions for increasing the way it was being done at the edges. I may have done some adjustments to make it come out right. I often do that when I am altering patterns like making this one bigger. I can’t get to it at the moment. I can’t remember if she answered me on the blog or privately. I do know that you don’t increase with every row, just like when making a circle. this day i see your pattern the first time and its great!!!! Thanks so lot for sharing with the bloggerworld. Greets from Germany and a big hug to raymond from salva ;-)! Your Mandala tutorial is great. The story and picture of my mandala is posted in my blog. Welcome! Alice, your designs are fantabulous!!! I am in awe!!! Thank you for this tut. I am going to try to put a link for the tut on my website! I hope that is ok with you!!! HOW have I not found you before? A fabulous kiwi crochet goddess right here in NZ?? 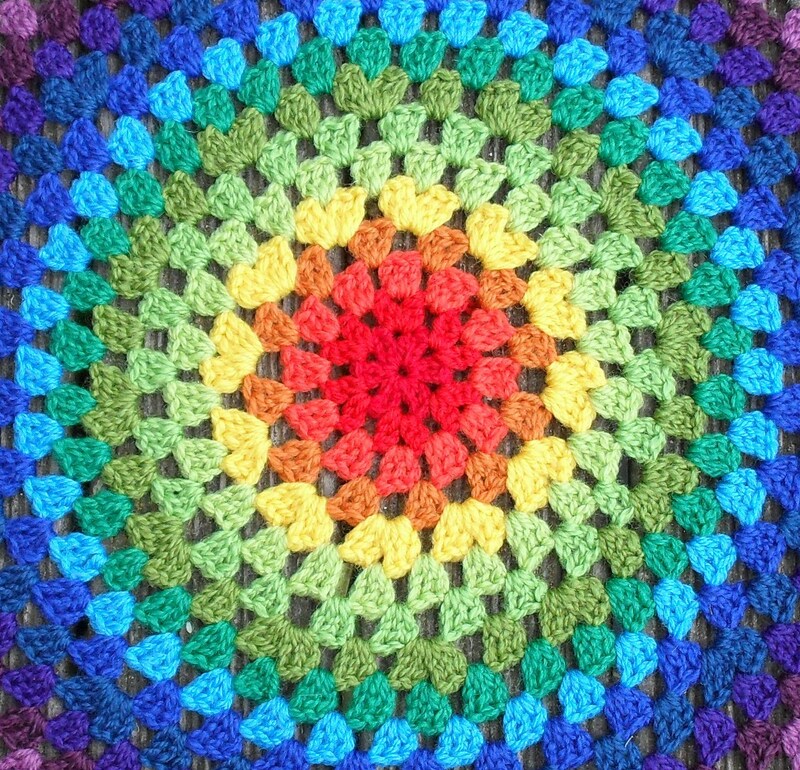 I’m nearly done with my first Grandala – loving LOVING making something so colourful and revisiting the Granny. Will post soon over at http://www.poppynbee.blogspot.com if you want to come and seeeee! I love your website! Thanks for sharing! Are DC’s in New Zealand Treble Crochet in the UK please? I’m getting a bit confused because they look like ‘our’ trebles???? Help anyone please? Anne Marie – this is written in US terminology – traditionally in NZ I understand we used UK, but so many patterns and designers are available to us now using US terms I think that we are now ‘bilingual’ crocheters down under! I actually find it easier to ‘speak’ in US terminology and when I teach crochet I use the American terminology. 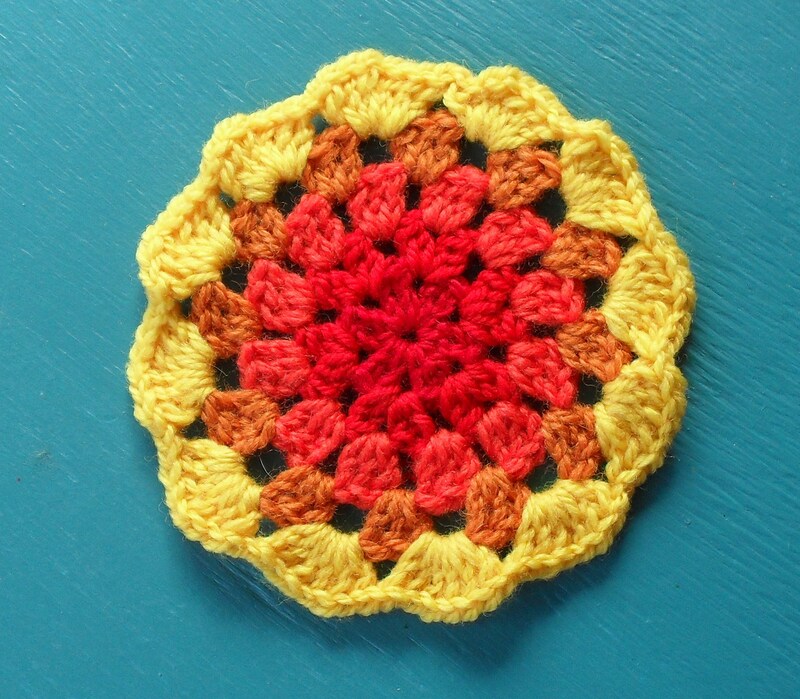 I have never really ‘warmed up’ for granny squares (don’t really know why) but this mandala is just lovely! I have the page bookmarked for future use. 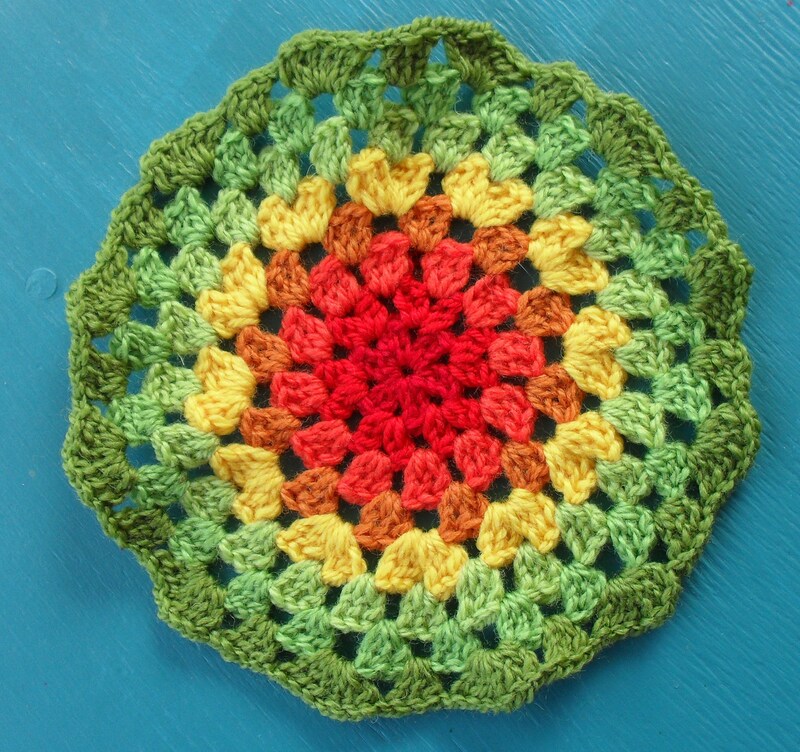 I love the Granny mandala…. Very Beautiful the Granny mandala. Very Thanks by the tutorial!! I love this piece. I have a question (for the blogger or anyone who can answer) this part is for the lovely lady that gave the tutorial: how did you secure the ends on this piece (any for anyone): how would you secure the yarn properly so it could withstand all the loving from a child or anyone who might not treat it delicately? Oh, I just found your name, Alice, I really love this work of art!!! Thanks in advance to anyone who might help with my questions. I’ve recently learnt the basics of crochet and am already a lover and painter of mandala’s. I’ve recently attempted one and it was very uneven. But looking at your picture’s is just so inspiring! I hope to try and follow some of your tutorials and hope it turns out just as lovely as your creations. What beautiful designs and colors you use. I look forward to many visits to your blog. Thanks for your designs, I’ll try to make a Granny mandala. I’m french and I will try to use your tutorial for the firt time. have a good day and thank you for this tuto ! I am 62 years old living in the countryside in Belgium. Philosopgy of bouddhism, Mandal talks to me and I love doing Crochet. I aodre nature, animals, biological foood vegetarian food;;;and again crochet. I have found your blog because of another blog where one of your friends talked aboutr your blog. Thank you for aceppeting me, and nice crochet work,lovelly colours! I just ordered japanease books for their easy diagrammes! Such a beautiful site to see! Thank you for sharing. So cute and great, and magnifical! Thank you for the tuto, you inspire me for my granny mandala’s vest. It’s wonderful of you to share your knowledge with the rest of us so generously! I’m so glad I came across your blog and look forward to reading more of your posts! Thank you! I did it! I also sat with my 17 year old daughter and taught her as well! All the gorgeous colours caught both our attentions. It was so lovely to stop and sit quietly with her and share this together. We lead such ridiculously busy lives! After posting my gorgeous mandala online, I shared your website with friends so they could learn how to do one too. Thank you for inspiring me to crochet again. Not quite sure what I am going to do with it now but I love it! lovely! glad to hear you had so much fun with it, and no need for it to have a function! Hello again. I see nobody here has gotton to crochet a real pretty colorful Granny Circle Crochet Hat yet. Well, maybe still it’s going to take some more time. So still continue to crochet pretty. Also, for the person asking how to get it to lay flat, my guess would be that there was too much increase in a few of the last rounds (I did the same thing) and that creates the ruffle. You can try blocking it, but with acrylic, I’m not sure if that would help (plus it would require a huge space to block). I bet the ruffle is pretty though, so don’t worry about it! I love this granny mandala so much! I’ve been here time and time again trying to understand the instructions, and last night, I FINALLY got it! I LOVE LOVE LOVE your colors, but I couldn’t wait to get them so I started with the colors and yarns that I have and I LOVE IT! I just learned to crochet in the last year and this just blew my flip flops off. THANK YOU SO MUCH. I signed up for updates cuz you got me HOOKED. Everything so beautiful!! Thanks for sharing! I love your mandala, it’s so beautiful and inspiring. I’m fairly new to crochet and it takes me a long time to decipher the patterns. Do you have a diagram for this? I’ve found them to be so much easier to understand when I can see the big picture. Hi! Just found your page and it’s awesome!!! Thank you for all the patterns and inspiration! I have started like mad to do a couple and it’s really fun and easy with your help! All the best to you from Sweden! Thank you for this great tutorial. I have just discovered your blog and I love it, specially this Mandala pattern. I ‘m a begginer in crochet, but I’m becoming an addict!!! I think I’m going to learn a lot with your tutorials. Love your granny’s . your choice of colors is beautiful . wish I had your eye for matching colors sigh. I’m just learning to crochet , the one craft that I have had a little trouble learning love my knitting and tatting . hopefuly I will have better luck this time . Thank you thank you thank you SO MUCH for posting this tutorial! I stumbled across it while searching for easy doily patterns and fell in love with all the colourful creations on your blog. I used fine acrylic yarn and a 3.75mm hook to make this centrepiece for my mom in law (to be). 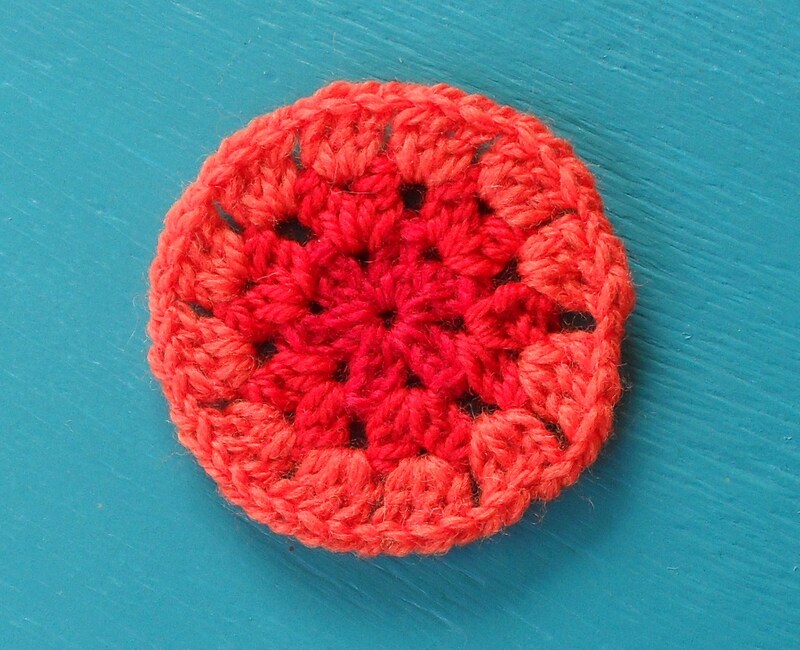 Seeing all the beautiful things on your site has encouraged me to want to learn crochet. While I have taught myself to knit -my favorite is lace patterns, I have tried unsuccessfully to crochet several times. I’ve watched my daughter crochet afghans, doilies, shawls and little accessories but have never been able to get the hang of it and I’ve no idea why. It is the only craft I’ve tried that I couldn’t do! Thanks for the inspiration…perhaps I just need projects like these and bright cheerful yarn to spur me on : ) Your projects are truly beautiful. Hi Alice, your blog is so inspirational to me. I am making my daughter Octavia a vest from the crochet mandala pattern. I will post a picture when I am finished, so you can see when you return from your hiatus. Peace to you, KB and of course Raymond. I was thrilled to see your pouff cover in your mandala section. I have newly returned to crochet’ing and this is exactly what I’ve been looking for. I am not sure how to crochet the sides. I truly hope you can help me. With many thanks. I really enjoyed your explanation of this pattern and will be saving it to my favorites on Ravelry. You seem to really enjoy creating and I do need some inspiration right now, so THANK YOU! Hopefully I’ll have something to post soon. I’m thinking of turning this into a lovely Pride beret or something with a goth color scheme. Gorgeous! Would you mind sharing the kind of yarn you used? Thanks! i make pot holder dresses. i make them in two different colors. After seeing your rainbow work I decided to make a set of the dresses in the rainbow colors. They turned out great. Thanks for the idea. your colors are so beautiful that I feel like weeping for joy when I see them. Thank you! I am making this as a baby blanket for a friend. I read over your instructions, but I can’t find the yardage for the yarn. Am I missing it, if not, could you give me a rough estimate for the outer rings? quick questions when you say “to the SAME space, dc2tog, ” are you refering t a decrease stitch (which is dc2tog} or are you refering to 2dc [do two double crochet in the same space}? if i wanted to jeep going and make it bigger how would i do that? Help! I actually plan on making it to the size of a hulahoop and crocheting it to the hula and hanging it on the wall!! Thankyou so much for such an easy to follow pattern,i am really enjoying making a granny mandala. Question/Clarification: After Round 16, how frequent are the increases? I understand that they’re to be every 4th row, but at what frequency within the round? Round 5 was increase in every space, Round 8 was every second space, Round 12 in every third space and Round 16 also in every third space? Does this same pattern continue (every third space) or do the increases become less frequent at some point, or on a recurring basis? Any assistance would be greatly appreciated! HI, As has been asked before, please could you post the increase sequence for further rounds of this lovely mandala? Is the next increase round (round 20) increase in every 4th space, the next increase round the same and then the next (round 28) in every 5th space? I’d like to know the answer to that myself. I’m on round 20 and it doesn’t come out right. Hi Alice, Thank you for your beautiful Granny Mandala ottoman pattern. I am going to make 2 for my girls. Your work is a ray of sunshine. I Just started making this and I’m not sure what I am doing wrong. You’re probably just crocheting a little too tightly. I used to have the same problem. Make sure that you didn’t skip one of the clusters like on row 3&4, make sure there are 3 in 1. If you continue to increase, do you still do an increase every 3- or do you move up to every 4, every 5, every 6, etc..? Nevermind- just saw a previous post with that issue! Sorry! I am a beginner at crocheting and I love a lot of your pieces that you have created. Do you have videos I can follow as I get very confused with the text patterns. I tried to create your granny teapot which was a success but finding it hard to follow the mandala.hope you can help and keep on doing what your doing!!! I have tried several German patterns for granny circles but finally couldn’t make it. Reason? Don’t know. Since I have been already successfully with your granny triangle pattern bunting, I thought I should give it a try with Raymond … and … guess what … I’ve been successfully again, this time with a granny circle. Many thanks for those patterns of yours and your understandable explanations, really appreciate them! I just discovered your blog and am now signed up for the crochet inspiration your work gives me. I haven’t been crocheting very long but it has become my newest hobby in my golden years. I go to any store with a yarn dept., or worse yet, a craft store with a large assortment of yarn. thanks for your lovely message, I’m glad to hear you are enjoying your new hobby! Can one do this pattern with half double crochets? I want to make a rug using tee shirt yarn, and I want the rug to be less flimsy, I.e. Tighter stitches, less holes and spaces. Any ideas? I love your granny circles!!!! Thanks for this tutorial. It’s really beautifull!!! Can you tell me the complete name of: “ch” (i suppouse that is chain), “dc”, “tog” “rd” “slst” “clustet” “shell stitch” “hdc”, because i speak a little english and i don’t know the abbreviation. If you did 2 rows of each colour would it make up a blanket size for a bed? This is such an awesome and easy to read pattern! Thanks so much! I continued past row 16 to make this Mandala into a circle vest. I had been looking for an easy to read pattern for a circle vest but kept getting flustered. This pattern was an excellent start! !